The striped bass bite continues to remain red hot in south jersey. We skipped out on the Trade In early today and go ton the troll at first light. The water temperature has dropped to 49 degrees, and I didn’t have too much as far as marks go for bait and fish. The early morning bite for us was a slow pick at best, but we did get our best fish of the day weighing in at 36 pounds on a Purple Bomber Plug. We picked up a few more on that plug, but the rest of the fish today fell victim to the chartreuse Mojo which has been the hot lure all week. After pounding it out all morning we made the run North to where a good bite was and we got into the melee. 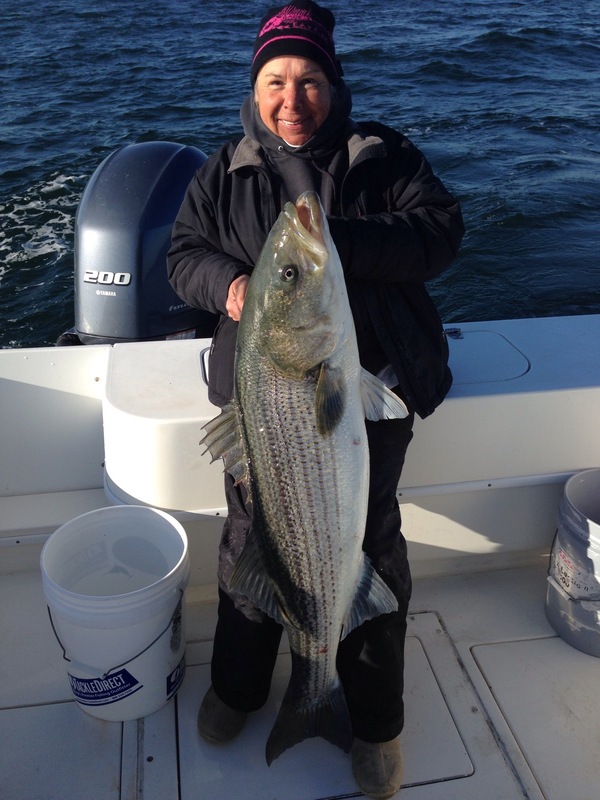 It was game on with doubles and triples of striped bass. We lost count as the bite was fast and furious, and we had a blast. At this point the wind had come on strong out of the SW and created a 4-5 foot tight chop so we called it a day and were plenty happy with it. 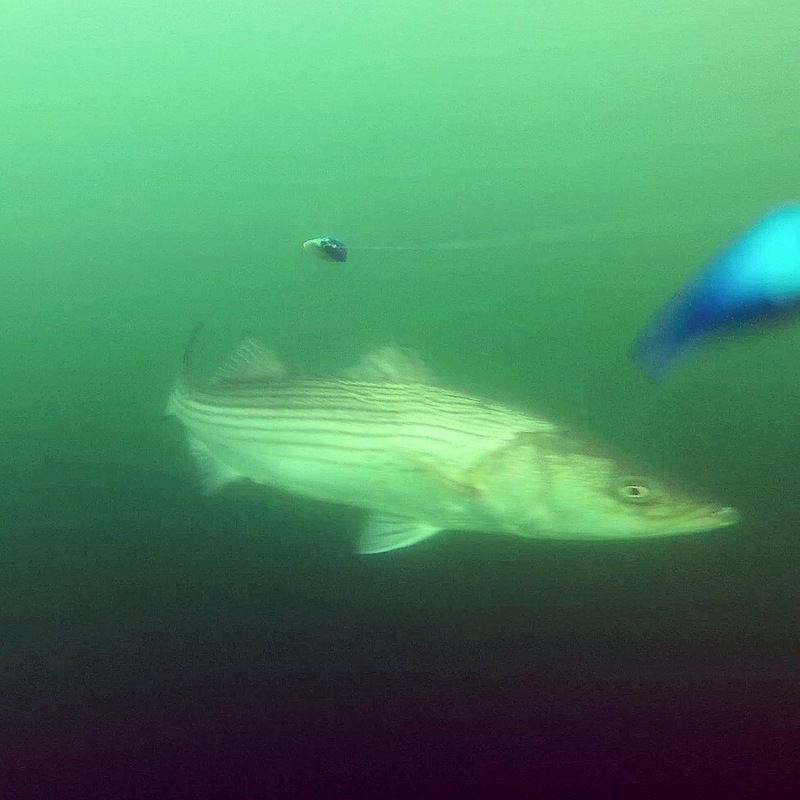 Today I got some amazing troll pro footage that I am super excited about of a striped bass eating a shad body as well as numerous others stalking my umbrella rig. Another great day of fishing, looking forward to hopefully another repeat tomorrow. I will be posting videos from this Epic week of striper fishing including the troll pro footage on this website in the VIDEOS section as well as on my YouTube Channel http://youtube.com/capatainrickywheeler so be sure to SUBSCRIBE to my Youtube Channel and Bookmark my website to keep up with the action. Great post! How are you running the mojo parachutes? We are IGFA line class fishing so I can only run them as single Mojos to remain IGFA Compliant. I am pulling them just off of the bottom since we are targeting bigger bass and they tend to hang near the bottom more often then not. This is pretty easy to do at 2-3 knots with 16-25 ounce Mojos. Sweet and simple. I will have a tackle talk video segment on that here by the end of the month that I will post on here with some info on how we have been trolling. You may find it worthwhile to check out. Good luck out there! Catch em up!